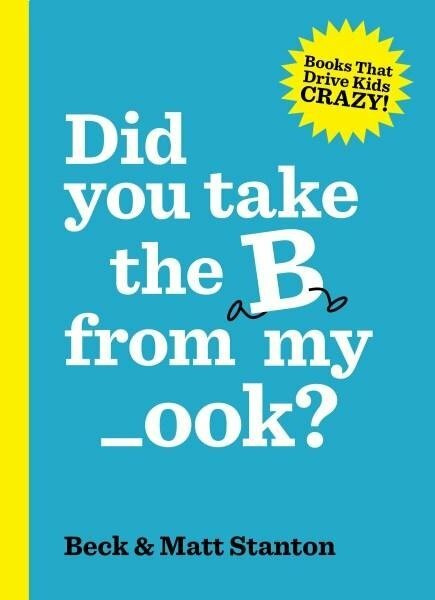 The narrator loves the letter B, but when he sneezes all the Bs are suddenly missing from the book. A bed becomes a “_ed”, a beetle becomes a “_eetle” and a blue boots “_lue _oots”. After several silly spreads of B-free words together in silly sentences (such as “the _eetle is wearing the _lue _oots and jumping on the _ed”), the narrator urges readers to call for the letter B to come back. When B is back the narrator celebrates by using B-words such as bravo and brilliant! Along with the colourful and simple line drawings, the book features bold and graphic typography throughout. It’s an excellent book for developing children’s print awareness as the book features letters in isolation (e.g. the B running away and reappearing at the end), visible sounds (e.g. “brrrrrr”, “achoo”) and various typesetting changes where the colour, size and direction of font changes. For further speech and language targets in ‘Did You Take the B from My _ook?’, see the list below.